The Saskatoon Stars celebrate back-to-back SFMAAAHL title wins. SWIFT CURRENT – At age 14, Grace Shirley showed she is ready for the big moments. On Saturday night, the skilled forward blasted home a goal at the 4:08 mark of overtime to deliver the Saskatoon Stars to a 4-3 victory over the host Swift Current Diamond Energy Wildcats in Game 4 of the Saskatchewan Female Midget AAA Hockey League championship series. The win at the Fairview Arena in Swift Current allowed the Stars to take the best-of-five series 3-1 and capture the Fedoruk Cup for a second straight year. “It was really overwhelming,” said Shirley after scoring her OT winner. “It was crazy. I was just kind of happy to see it squeak in there at the last point there. For a while, it looked like the series was going to head back to Saskatoon for a series deciding Game 5 on Sunday. The Wildcats led 3-1 with 4:39 to play in the second period, before the Stars cued the comeback. Grace Shirley blasts home the OT winner for the Stars. Just 58 seconds after the Wildcats went up 3-1, Stars defender Rayah DeCorby fired home an accurate long distance off-speed shot to cut the gap to 3-2. Saskatoon tied the contest up at 3-3 at the 9:03 mark of the third, when Anna Leschyshyn potted home the rebound from a shot taken by linemate Julia Rongve. “To be able to come back after that game and come out on the right end of it, I am so proud of the girls,” said Stars head coach Greg Slobodzian. “They worked so hard, and then to go down like that in a game when you’re outplaying them, that is tough. The Stars took a 1-0 with 38.81 seconds to play in the first, when 14-year-old rookie forward Joelle Fiala converted a tick-tack-toe passing play from linemates Grace Shirley and Abby Shirley. Saskatoon had Swift Current pinned in its own end during the opening 20 minutes holding a 13-1 edge in shots on goal. Stars captain Danielle Nogier is stopped by Wildcats goalie Jacey Book. The game’s momentum turned in the second, when the Wildcats surged ahead on three straight markers. First, Josee Casavant scored from in close, and just 1:42 later, Merissa Zerr slipped a beauty pass across the face of the Saskatoon goal to allow linemate Janessa Fournier to pop in a tally to give the hosts a 2-1 edge. Right-winger Taylor Kirwan tipped home a power-play goal with 4:39 to play in the second to give the Wildcats a 3-1 edge. Saskatoon proceeded to rally back. Stars captain Danielle Nogier said taking the series clincher in come-from-behind style was sweet. Emma Johnson made 17 stops to pick up the win in goal for the Stars. Jasey Book turned away 35 shots to take the loss in net for the Wildcats. Janessa Fournier, left, celebrates scoring for the Wildcats. The Stars topped the SFMAAAHL regular season standings with a 24-4 record, while the Wildcats were second in the eight-team circuit with a 19-6-3 mark. Every game in the SFMAAAHL championship series was decided by one goal. Nogier, who will join the University of Saskatchewan Huskies women’s hockey team next season, was proud her team was able to repeat as SFMAAAHL champs. “I can’t explain it,” said Nogier, who was an assistant captain last season. “Words can’t describe how amazing this feeling is just winning this with my girls, my family. Entering the season, the Stars were not considered a sure thing, when it came to repeating as champions. In the off-season, they lost superstar forwards Sophie Shirley, who is Grace’s older sister, and Nara Elia to the Notre Dame Hounds Junior Women’s Hockey League team. Both Sophie Shirley and Elia were eligible to return to the Stars as 16-year-olds. Anna Leschyshyn breaks into the offensive zone for the Stars. When the Stars claimed their first SFMAAAHL title in 2014-15, they had one of those rare special campaigns. They posted a 45-5 overall record, which included a 25-3 mark in the regular season. Saskatoon also won the prestigious Mac’s tournament in Calgary and a bronze medal at the Esso Cup national championship tournament. In 2015-16, the Stars had to prove they were still a good team without their two superstars, but they were viewed a beatable club. Slobodzian, who was head coach for both SFMAAAHL title wins, didn’t want to rate one as being more special than the other, but he noted they were enjoyable for their own unique reasons. “They’re different,” said Slobodzian. “The first one obviously was special. The Stars advance to a best-of-three regional final against the Manitoba champion Yellowhead Chiefs, who are based out of Shoal Lake. All three of those contests will be played in Shoal Lake from April 1-3. The winner of the regional series qualifies for the Esso Cup national championship tournament, which runs April 17 to 23 in Weyburn. If you would like to pass along any comments about this post, feel free to email them to stankssports@gmail.com. Check out Stars game and celebration photos on Twitter @stankssports. Warriors F Noah Gregor scores on Raiders G Rylan Parenteau. PRINCE ALBERT - If all games between the Moose Jaw Warriors and the Prince Albert Raiders are going to be as good as this one, here is hoping their opening round WHL playoff series goes the distance to Game 7. The Warriors downed the Raiders 3-2 in a thriller in Game 1 on Friday night at the Art Hauser Centre before 2,782 spectators. Both teams engaged in frantic action up and down the ice. Shaw television had to be thanking their lucky stars they decided to broadcast that contest for its entertainment value, and the WHL head office staffers had to felt they hit a jackpot. Goaltenders Rylan Parenteau of the Raiders and Zach Sawchenko of the Warriors each stood on their heads making 36 and 32 stops respectively. The consensus among NHL scouts has been that the quality of goaltending on average had been down in the WHL this season, but you wouldn’t have known that the way the series opener between Moose Jaw and Prince Albert played out. After a scoreless opening frame, the Raiders drew first blood in Friday’s clash at the 8:17 mark of the second, when Reid Gardiner blasted home a shot on the power play to give the hosts a 1-0 edge. The Warriors countered just seconds into their first power play at the 14:17 mark of the frame on a tally from star captain Brayden Point. The Art Hauser Centre crowd that had worked their way into a frenzy had the wind momentarily knocked out of their sails. Moose Jaw dealt the home side faithful two more gut shots going ahead 3-1 in the third. Jesse Lees missed a late chance to tie the game. First, Point and linemate Noah Gregor broke in on a two-on-one break, and Point fed a perfect pass across the face of the Raiders goal to Gregor, who knocked home the puck past Parenteau. At the 13:51 mark, Gregor potted his second goal of the night on a turnaround shot. The Warriors first unit of Point, Gregor and Dryden Hunt came out against a tired Raiders unit after an icing call on the offensive faceoff that eventually resulted in the third goal. Prince Albert elected to not use a timeout. The Warriors weren’t able to enjoy the two-goal cushion for long. Just 34 seconds after they went ahead 3-1, Raiders right-winger Austin Glover knocked home a shot from the left side of the Moose Jaw goal to cut the visitors edge to 3-2. The tally reignited the gathering at the Art Hauser Centre. The Raiders proceeded to make a big push in the game’s final moments. With under two minutes to play, overage defenceman Jesse Lees had a golden chance to pick up the equalizer down low, but he fired a shot over top of the Warriors goal. In the final seconds of the third, the puck slid over to Gardiner down in the left slot of the Moose Jaw zone, but the veteran, who netted 43 goals in the regular season, fanned on his shot. The Warriors were elated at the end of the game to skate away with a victory. The only drawback for them in the contest was losing Russian forward Nikita Popugaev to a right leg injury after he received a hit along the boards in the first period. Both clubs also picked up the physical play throwing a handful of good hits each. While Prince Albert supports left disappointed about the end result on the scoreboard, Game 1 of the Raiders series against the Warriors was a hit. And you know what the best part is? Both teams go at it again in Game 2 on Saturday at 7 p.m. local time at the Art Hauser Centre. The Stars celebrate a power-play goal scored by Willow Slobodzian. Laser beam shots courtesy of Anna Leschyshyn and Willow Slobodzian proved to be all the Saskatoon Stars needed. The two standouts from Saskatoon each fired home rockets on the power play to deliver the Stars to a 2-1 victory over the Swift Current Diamond Energy Wildcats in Game 3 of the Saskatchewan Female Midget AAA Hockey League championship series on Thursday at the Agriplace Arena. The win allows the Stars to take a 2-1 edge in the best-of-five set, and they will try to capture a second straight league title in Game 4 on Saturday when the series shifts back to Swift Current (7:45 p.m., Fairview Arena). On Wednesday, the Stars claimed Game 2 of the series in Swift Current at the Fairview Arena, when skilled forward Mackenna Parker netted the game’s only goal in the third period in a 1-0 final. Stars goaltender Emma Johnson made 18 saves to pick up her seventh career SFMAAAHL playoff shutout. Jasey Book, who was named the SFMAAAHL’s most valuable player and top goaltender, turned away 27 shots taking the loss in goal for Swift Current. On Thursday in Saskatoon, the Stars stormed out of the gate and had the Wildcats pinned in their zone. Working on the power play, defender Hollie Coumont and forward Julia Rongve teamed up to get the puck over to Leschyshyn, who wired home a shot from the front of the goal near the top of the two faceoff circles at the 8:37 mark of the opening frame. Wildcats goalie Jasey Book stops Stars forward Mackenna Parker. The 14-year-old’s tally was the Stars eighth shot on goal of the game, and the hosts held an 8-1 edge in shots on goal at that point in the contest. From that moment, Book, who has committee to join the University of Saskatchewan Huskies women’s team, went to work to try and prevent the Stars from getting any further ahead in what was a fast-paced affair. In the second period, she made two in close saves on Grace Shirley, who is the SFMAAAHL’s rookie of the year, and Parker respectively. Saskatoon finally got a key insurance goal at the 11:53 mark of the third period, when Slobodzian, who was named the SFMAAAHL’s top defender, fired home a power-play goal through a screen to the top corner of the Swift Current net to give the hosts a 2-0 edge. The Wildcats, who were backed by a huge and raucous fan following that made the trip to Saskatoon, proceeded to mount a big push back, which caused Johnson to make a few critical saves. Swift Current final broke through with 57.1 seconds to play in the third, when 17-year-old forward Kaci Jones potted her fourth goal of the post-season cut the Stars lead to 2-1. Saskatoon proceeded to close the contest out defensively, as the Wildcats didn’t have any solid scoring chances after their goal. Johnson made 20 saves to earn the win in goal for Saskatoon. Book made 27 stops to take the loss in Swift Current’s net. If the Wildcats win on Saturday to force a series deciding Game 5, it will be held Sunday at 7:30 p.m. at the Agriplace Arena. Willow Slobodzian was named the SFMAAAHL's top defender. NOTES – Stars head coach Greg Slobodzian was named the SFMAAAHL’s coach of the year, when the league handed out its awards. Stars captain Danielle Nogier won the award for being the SFMAAAHL’s top scholastic player. Her older brother Nelson, who currently plays for the Red Deer Rebels, was the WHL’s scholastic player of the year in 2014, when he was still a member of the Saskatoon Blades. Willow Slobodzian was a first team SFMAAAHL all-star on defence, while Shirley and Parker were first team all-stars at forward. Book was a first team all-star, while Wildcats defender and captain Kayla Kirwan and forward Chloe Smith were second team all-stars. Blades captain Nick Zajac looks dejected after a Wheat Kings goal. The Saskatoon Blades might be a perfect case study to show how long a rebuild normally takes in the Western Hockey League. A charter member of the WHL, the Blades entered the 2015-16 campaign with hopes of returning to the playoffs. Instead, they ended up missing the post-season for a third straight year – first for the team - after hosting the Memorial Cup tournament in 2013. While they are still one of the youngest squads in the league, the Blades jumped out to a 7-4-3 start and comfortably held a playoff spot posting 9-7-3 mark going into action on Nov. 20, 2015. From there, they went on a down stretch posting one win in 10 games. Going into the WHL Christmas break, the Blades record sat at 14-19-3, and they were two points out of a playoff position. They kept slowly slipping further and further out of the playoff picture, but did manage to play meaningful games in early March. Saskatoon finished with a 26-42-6 record to sit 20th overall in the 22 team league with 56 points. Had they been able to earn 10 more points in the standings, they would have held down the final playoff berth in the WHL’s Eastern Conference. Connor Gay led the Blades in scoring with 72 points. Still, they improved upon last season’s 19-49-2-2 mark and a 16-51-2-3 record posted in the 2013-14 campaign. After hosting the Memorial Cup, the cupboard was close to being empty, so a return to post-season action was expected to take some time. Even with all that in mind, the Blades hard their hearts set upon making the post-season at the start of the 2015-16 campaign. To some degree, it felt like the 2015-16 season was an opportunity that was missed. The double blue’s struggles occurred because they could never find consistency in goal or on defence. Saskatoon product Brock Hamm was the starter posting a 21-26-3 record, a 4.02 goals against average, a .885 save percentage and one shutout. Parker, Colorado, product Evan Smith finished as the back-up posting a 2-9 record, a 5.75 goals against average and a .843 save percentage. Looking at those statistics, one could see the Blades were going to be hard pressed to win games. Both netminders had their moments when they looked great, but they also had too many moments when it appeared the confidence was gone. The goalies didn’t have much help from the defensive unit. The Blades play from their defensive unit was as erratic as the play of their netminders. Colton Waltz one of the more steady rearguards for the Blades. All the Blades regular defencemen had minus ratings in the plus-minus department. Overager Colton Waltz had the best campaign statistically recording five goals, 25 assists and a minus-five rating in 65 regular season games, but much of those stats were built playing 34 contests with the Brandon Wheat Kings. Waltz was acquired shortly before the WHL’s trade deadline. Payton McIsaac, who was a midget AAA call up from Fort Saskatchewan, had a plus-four rating in 10 appearances for the Blades to go along with an assist. The second round selection in the 2015 WHL Bantam Draft has a good chance to be part of the Blades on a full-time basis next season as a 16-year-old rookie. Saskatoon couldn’t do much to strengthen both of those departments via the trade route due to the fact goaltending and defence on average wasn’t as strong this season in the WHL as it has been in the past. Had both of those units just been slightly more productive, the Blades might have made up the 10 points they needed to get into the post-season. Up front, the Blades probably received what they could have out of their forward unit. Connor Gay, Cameron Hebig, captain Nick Zajac and Ryan Graham all netted 20 or more goals. Gay topped the team in scoring as an overager with 25 goals and 47 assists. Hebig battled injuries, but he still piled up 26 goals and 43 assists in 59 contests. Head coach and GM Bob Woods has more retooling to do with the Blades. The Blades also had too many games in 2015-16 where their work ethic just disappeared. It seemed like the stench from the struggles from the previous two campaigns started to rear its head this season. If the opponent jumped out to a quick two-goal edge, the Blades folded way too often and lost by a convincing outcome. In 2014-15, it seemed like the work ethic was always there, even though the team was outmatched on most nights. With that in mind, head coach and general manager Bob Woods and assistant coach Dean Brockman both just finished their second seasons with the club. Both are capable hockey men and need to continue the progress that has been made. The Blades still pulled in 8,932 spectators for their final regular season game on Saturday, which they won 3-2 over the visiting Prince Albert Raiders. Saskatoon’s average attendance of 4,377 was still down from the past two seasons, but was 12th overall in the league. “The Bridge City” bunch is getting there. A light at the end of the tunnel is visible. Playoffs may be a reality in 2017. Bob Ridley calls a game at The Arena in Medicine Hat. When the Medicine Hat Tigers appear in their first standings tiebreaker game, their iconic play-by-play voice will hit another milestone. 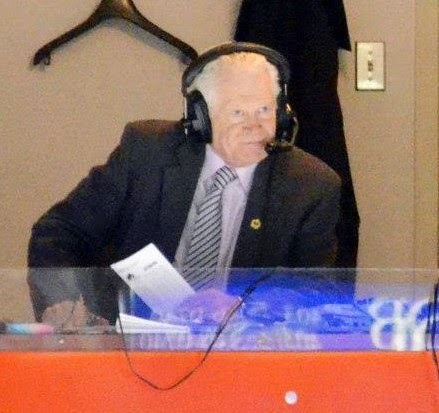 Bob Ridley, who has been the WHL team’s play-by-play voice since the club’s inception in 1970, will call his 3,700th career game when the Tigers host the Edmonton Oil Kings on Tuesday at 7 p.m. local time at the Canalta Centre. He has called 3,291 of the 3,292 games the Tigers have played in the regular season, all of the club’s 388 games in the WHL playoffs and all 20 contests the team has played in the Memorial Cup tournament. Tuesday’s match will mark the first time Ridley has called a tiebreaking game in his career. It is believed that no one in Western Canada has called more hockey games as the play-by-play announcer for one team at the amateur or professional level than Ridley has. The Tigers and Oil Kings both recorded 65 points in the WHL standings to finish in a deadlock for eighth overall in the Eastern Conference and the conference’s final playoff berth. The Tigers were 30-37-3-2, while the Oil Kings were 29-36-6-1. Medicine Hat earned home ice advantage due to having more wins. The winner of that contest travels to Brandon on Thursday to meet the Wheat Kings in Game 1 of a best-of-seven first round playoff series. Brandon topped the Eastern Conference and finished second overall in the league with a 48-18-4-2 record. The Tigers have made the WHL playoffs for the last 13 consecutive years and advanced to the second round in 12 of those appearances. Sophie Shirley in action last year for the Saskatoon Stars. I recently caught up with local hockey standout Sophie Shirley for a feature story in the Saskatoon Express. The 16-year-old forward was spent the 2015-16 campaign as a rookie with the Notre Dame Hounds squad that plays in the Junior women’s Hockey League. She was also a member of Canada’s team that won a silver medal at the under-18 world’s in January in St. Catharines, Ont. Last season, Shirley helped the Saskatoon Stars win their first Saskatchewan Female Midget AAA Hockey League title and a bronze medal at the Esso Cup national championship tournament. Her Express feature story can be found right here. Captain Kendall McFaull and goalie Jordon Cooke celebrate a win. For short time, “The Call” will be the dominant memory the University of Saskatchewan Huskies men’s hockey team and their supporters take away from the 2016 University Cup. “The Call” of course refers to the checking from behind penalty assessed to Huskies standout forward Levi Cable at the 16:27 mark of the third overtime period of a University Cup semifinal clash against the St. Francis Xavier University X-Men. On the ensuing power play, X-Men forward Michael Clarke laser beamed home the winning goal from the slot to the top corner on Huskies star goaltender Jordon Cooke with 2:25 to play in the third extra frame cementing a 2-1 result in favour of St. Francis Xavier. In that instant, the Huskies were knocked into Sunday’s bronze medal contest at the Canadian Interuniversity Sport national championship tournament held in Halifax, N.S. U of S took a 2-1 lead in that contest against the St. Mary’s University Huskies before fatigue really set in to allow St. Mary’s to skate away with a 5-2 victory. The green and white Huskies were forced to return home to Saskatoon with a fourth place finish. Sunday’s result was overshadowed by the events that led to Saturday’s heartbreaker. Cable was called for hitting from behind on a play that was a borderline small shove in the back at best. The infraction happened near the boards, which could have made it look at other angles worse than it was. During the three overtime periods, the officials let a lot of other things go that were visibly more serious infractions of the rules. Levi Cable was given a weak OT penalty in Saturday's CIS semifinal match. The call on Cable was soft compared to those other infractions, and with both teams showing signs of fatigue, it gave the X-Men an edge at a critical moment to win the game. When the Huskies lost, it felt like they got cheated. Locally in the immediate aftermath in Saskatoon, the social media lines blew up with Huskies supporters showing their displeasure with the officials. If some of the supporters were team members of staff, they would be looking at getting sizable fines comparable to those level against former WHL Regina Pats general manager Brent Parker, when he used to voice his critiques of officials. The Huskies players, coaches and support staff will no doubt have to each deal with their own emotions regarding how the tourney played out before moving on. U of S was making its 17th appearance at the University Cup, but this marked the first time the Huskies played in the event under an elite-eight single elimination format. This was the second year the University Cup was played under that structure, which helps produce “March Madness” style drama. The Huskies felt the lowest of lows in the semifinal, but for a time, they seemed destined to experience only highs. Parker Thomas was an OT hero for the Huskies at University Cup. They finished first in the Canada West conference with a 22-6 record and won all four of their games in the Canada West playoffs to capture a 17th conference title according to information supplied by Michael P.J. Kennedy, who wrote two editions of a the history book on the Huskies men’s and women’s hockey teams. Powering the run of the Huskies men’s hockey team was an emotional push to honour the memory of alumni Cody Smuk, who passed away of cancer in late June of 2015. Smuk was a hard-working, team first, glue guy who was endearing to the Huskies and the community of Saskatoon. His number was retired before a home game on Oct. 24, 2015. All season, the Huskies warmed up at home all wearing Smuk’s #24 jersey, and they continued that tradition at University Cup. When they won the Canada West title at the ancient Rutherford Rink on March 5, they brought out Smuk’s parents, father Marty and mother Darla, and his fiancée Stephanie Vause to be part of the on-ice team picture. In their first game at the University Cup, the Huskies experienced another big high. Huskies forward Parker Thomas showed a beauty set of hands popping home the winning goal at the 6:11 mark of a fourth overtime period to allow U of S to down the Carleton University Ravens 3-2 back on Thursday. The match was longest game in the history of the University Cup lasting 116 minutes and 11 seconds. After one game, the Huskies had to be thinking the event’s single elimination format was a sweet deal. The Huskies lost Michael Sofillas due to injury. The experience of all those cumulative highs made Saturday’s outcome that much tougher to digest. Anyone involved with the Huskies had to think what happened in the loss to the X-Men wasn’t real. There were also other things that went wrong in the semifinal loss. In the first period, the Huskies lost sophomore forward Michael Sofillas to a preventable injury. Sofillas was skating through the centre ice zone in front of the penalty box area, when a roughing infraction to X-Men forward Brad Cuzner was about to expire. Cuzner got out of the box and nailed Sofillas, who was lost for the rest of the tournament. Off-ice officials should have had player safety in mind and waited a couple of seconds for Sofillas to skate by. Instead, the U of S forward was blindside by someone who appeared to emerge out of a wall. Sofillas couldn’t defend himself, because he had no chance to see Cuzner was coming. The Huskies also saw their 1-0 lead disappear in the second period, when Cuzner burned them with a short-handed breakaway goal created by a nice chip pass by linemate Steven Kuhn. Those little things ultimately make the difference in a sudden death game. The third team, the officials, did have their struggles on Saturday, and if you are honest, fatigue started to catch up with them the longer overtime went. They are human too. In the third overtime period, that fatigue started to show up in a handful of botched off-side calls, which should have been simple to make. Fatigue likely played a factor in how the officials saw the infraction they gave to Cable. Bad calls are always going to be part of sports. Bad calls are also going to happen in critical moments of playoff games. These days, officials do more off-ice work than they ever have before with video, and the three-overtime semifinal contest involving the U of S was likely a big learning experience for them. The Canada West title win will highlight the 2015-16 Huskies season. In the end, the Huskies have to live with what happened at the University Cup. Over time, the players, coaches, support staff and supporters will find ways to deal emotionally with the University Cup outcome. The X-Men didn’t have a championship ending to their University Cup experience either falling 3-1 in the final to the University of New Brunswick Varsity Reds. While the University Cup didn’t return to Saskatoon for the first time since 1983, the Huskies had one of their most memorable years in 2015-16. The biggest memories were created by the day-to-day journey of the season and the celebration of a Canada West title win at home over their forever rivals the University of Alberta Golden Bears. It was a season that started without any lofty expectations and truly did honour Smuk’s memory. A bad call in a sudden death semifinal game will ultimately not erase the good that was accomplished. The Huskies storm the court after their Canada West title win. You have to love it when good people become national champions, and there are a lot of people that are happy for the University of Saskatchewan Huskies women’s basketball team. On Sunday in Fredericton, N.B., the Huskies captured their first Canadian Interuniversity Sport title downing the Ryerson University Rams 85-71. On the U of S campus, the Huskies women’s hoops team is popular due to the fact they pretty much go see all the other Huskies teams play whenever they get the chance, and they are involved in various community activities. They are all extremely personable and genuine, so there were definitely a large number of smiles on people’s faces on campus and in Saskatoon who watched the Huskies lift the Bronze Baby championship trophy on television. For head coach Lisa Thomaidis, the win was a reward that was a long time coming for almost two decades of hard work. The Ontario product, who is also the current head coach of Canada’s senior national women’s basketball team, became the Huskies bench boss in 1998, when the U of S women’s basketball program was at one of its lowest points. The idea of even being in a national final almost seemed impossible and even laughable. The Huskies weren’t often a first choice destination for hoops players in Saskatchewan. The University of Regina Cougars were an elite powerhouse team back then like they still are now, and they would win a national championship in 2001. Dalyce Emmerson (#13) is an all-time Huskies great. Thomaidis’s task was to prove Saskatchewan was big enough for two elite women’s university teams. She succeeded in spectacular fashion and also earned the reputation as being one of the best coaches in Canada in any sport. She mirrored one thing the Cougars were excellent in as far as recruiting goes. You find players that are good people first, who also happen to be good athletes. After three seasons, the Huskies were respectable and qualified for the post-season for the first time in 18 years. In 2006, they appeared at nationals for the first time under Thomaidis’s guidance after winning the Canada West title. The Huskies were now a powerhouse. This season, the Huskies won their third Canada West title in six years. The squad is full of players that are outstanding individuals you would do anything for. Making their eighth trip to nationals in the last nine years, the Huskies finally had their day in the sun. In all three rounds of the CIS final-eight tournament, the Huskies encountered adversity, but always answered the call and posted a solid win. Second seeded U of S dispatched the University of Ottawa Gee-Gees 73-62 in the quarter-final round and downed the St. Mary’s University Huskies 65-58 in the semifinal round. In the title game, U of S met the challenge of a high-temp and high-scoring Rams team. The Huskies trailed 22-18 after the first quarter, led 42-40 at halftime and rolled to a convincing win from that point. Kelsey Trulsrud nails a free throw. Fifth-year starters Laura Dally, Kelsey Trulsrud and Dalyce Emmerson played the entire 40-minute match for the Huskies. Dally, who was the most valuable player of the Canada West conference, topped the Huskies with 25 points, which included hitting four shots from three-point range. Trulsrud, who is a scrappy guard that stands 5-foot-9, added 14 points, pulled down 12 rebounds and picked up three assists. Emmerson, who might be the best post player the Huskies ever had, added 14 points, 12 rebounds, five blocked shots, two assists and two steals in the winning effort. She averaged 18.7 points and 15.7 rebounds per game in Fredericton. Latvian rookie point-guard Sabine Dukate was also a force in the final hitting four shots from three-point range, while recording 22 points, seven rebounds, seven assists and three steals. She filled a huge hole that was left when point-guards Kabree Howard and Riley Humbert graduated from the program last season. Howard stayed on with the Huskies this season as a graduate assistant coach. The rest of the Huskies roster is rounded out by first-rate people like fifth-year post Taya Keujer, Desarae Hogberg, Madeline Humbert, Sascha Lichtenwald, Megan Ahlstrom, Megan Lindquist, Kassidy Konkin, Vera Crooks and Janaya Brown. When you meet these players in public, you immediately want to go to their games. They are also great role models for any young girl that has a dream of one day playing at the CIS level for the Huskies. Laura Dally drive the lane for the Huskies. In the present, it now seems unthinkable that the Huskies winning a national championship was an impossible dream. All the alumnae that played on the Huskies before the current CIS winning title squad had a hand in pushing the bar higher and higher to ultimately make what happened on Sunday a reality. Alison Fairbrother and Jacqueline Lavallee were part of the dark days as players and enjoyed a national title win as assistant coaches along with program newcomer Megan Pinske. After a standout 18-2 regular season, the Huskies went 7-0 in the post-season. Their time was now, and a national championship victory had never been more deserved. Anna Leschyshyn drives hard to the goal for the Stars. The Saskatoon Stars don’t normally dig themselves into big holds, but the one they dug on Sunday night cost them the opening game of the Saskatchewan Female Midget AAA Hockey League championship series. Opening the series at home at the Agriplace Arena, the Stars fell behind 4-1 to the Swift Current Diamond Energy Wildcats heading into the second intermission. The hosts made a furious rally scoring twice in the third, but the Wildcats were able to close out a 4-3 victory in Game 1 of the best-of-five series. The Wildcats got the jump on the Stars from the opening faceoff and controlled play throughout the first period. At the 6:13 mark of the first, the Wildcats opened the game’s scoring when rookie forward Brooklyn Colburn potted her first goal of the post-season. That tally seemed to knock the Stars back on their heels for a good part of the first two periods. With 3.3 seconds to play in the first, Swift Current added a dagger of an insurance goal, when Kayla Kirwan picked up her first marker of the post-season to go along with seven assists. Swift Current outshot Saskatoon 17-8 in the opening 20 minutes. The visitor’s surge didn’t end there. At the 6:17 mark of the second, Wildcats winger Kaci Jones scored to give her side a 3-0 edge. The Stars managed to halt the bleeding for a short moment, when Jordyn Gerlitz popped her first of the post-season just 37 seconds after Jones’ goal to cut the Wildcats edge to 3-1. Josee Casavant, right, celebrates her goal with Kate Scidmore. Swift Current resorted its three-goal edge with 3:05 to play in the second. Breaking into the Stars zone on a two-on-one rush, Wildcats winger Kate Scidmore slipped a smart pass over to linemate Josee Casavant, which sprung her on a breakaway. Casavant tucked home her fourth goal of the playoffs to give the Wildcats a 4-1 edge. Shortly after that goal, Wildcats star forward Chloe Smith had a breakaway chance, but she was denied by Stars netminder Emma Johnson. In the third, the Stars, who are the defending SFMAAAHL champs, started to hit their stride. They cut the Wildcats lead to 4-2, when offensive defender Willow Slobodzian blasted home a point-shot goal on the power play. With 7:04 to play in the third, the Stars pinned the Wildcats in their zone for a long stretch that resulted in a goal from Abby Shirley to further cut Swift Current’s lead to 4-3. Saskatoon almost found the equalizer a short time after Shirley’s goal. Power forward Anna Leschyshyn, who already stands 5-foot-10 at age 14, muscled her way past a Wildcats defender on a one-on-one rush for a scoring chance, but she was stoned by 17-year-old veteran goalie Jasey Book. Book, who has committed to play for the University of Saskatchewan Huskies women’s team in the fall, made 29 stops to earn the win in goal for Swift Current. Johnson turned away 27 shots to take the loss in Saskatoon’s net. Stars goalie Emma Johnson stops Wildcats forward Janessa Fournier. The Stars topped the SFMAAAHL regular season standings with a 24-4 mark, while the Wildcats were second with a 19-6-3 record. Saskatoon won all four head-to-head regular season meetings between the two clubs, but the all of those encounters came before Dec. 1, 2015. Game 2 of the SFMAAAHL championship series is set for Wednesday in Swift Current for a 7 p.m. start at the Fairview Arena. Game 3 will be in Saskatoon on Thursday for a 6:15 p.m. start at the Agriplace Arena. Jordon Cooke was named the CIS's goalie of the year. The University of Saskatchewan Huskies men’s hockey team will have a different experience at the University Cup compared to their past visits to the national championship tournament. The Huskies last appeared at the University Cup as the host team in 2014. That year, the University Cup ran under its long time traditional six-team format. The competing teams were played in two pools of three and the first place team in each pool advanced to the title game after round robin competition within the pool. That format often at times could be confusing to follow. If a team lost its first game by a goal, that club still had a chance to make the final. You had to hope the team that beat you lost its next game, and you usually had to win your last round-robin game in blowout fashion to make the title contest. It often took a university’s best math ace to figure out the goal spread that was needed in that final contest to advance. Last year, the University Cup converted over to a final-eight format that is often used for various other sports in Canadian Interuniversity Sport and down in the United States in the National Collegiate Athletic Association. That means the eight-team field plays single elimination games through a quarter-final, semifinal and championship final rounds. The Huskies were eliminated in the first round of the Canada West playoffs last season, so they weren’t part of the University Cup tournament. This year they will get their first taste of a hockey style March Madness at nationals hosted in Halifax, N.S. U of S is the second seed and will face the seventh seeded Carleton University Ravens in one quarter-final match on Thursday. The Huskies, who are making their 17th appearance at nationals, topped the Canada West standings with a 22-6 record and claimed the Canada West championships with four straight post-season wins. The Ravens were 20-8 in the regular season, have gone 5-2 in the post-season so far and won a bronze medal in the Ontario University Athletics conference playoffs. Kohl Bauml was named to the CIS all-rookie team. An elite-eight tournament is easy to follow, because every team knows you win you move on, or you lose and you have no chance to make the final. If you fall in the semifinal round, you can still play for a bronze medal. Most players on the Huskies have limited experience playing in this type of tournament. As their roster is made up players main from the major junior ranks and also members of the junior A ranks, those players are more used to best-of-seven series. The best-of-three series that are played in conference playoffs usually feel like the post-season on speed. Single elimination leads to a possibility of a hot goaltender or a strange goal creating an upset. In extra time, the joy of victory becomes that much more heightened, while the agony of defeat is that much more training. The drama also increases, if a game’s finish comes during that stage. For now, the Huskies, or any of the other seven competing teams, can’t look past their quarter-final games. If the Huskies prevail on Thursday, they will advance to one of Saturday’s semifinals to face the winner of the quarter-final match between the third seeded St. Francis Xavier University X-Men and the sixth seeded University of Alberta Golden Bears. U of A has won the last two University Cups. The University Cup final is set for Sunday (5:30 p.m. Saskatchewan time, Sportsnet 360). Before the quarter-final round starts, a couple of Huskies picked up individual honours on Wednesday. Jordon Cooke was named the CIS goaltender of the year and a first team all-Canadian all-star. Forward Kohl Bauml was named to the CIS all-rookie team. Julia Flinton was named a first team all-Canadian all-star. Julia Flinton collected one last accolade to further cap her five-year career with the U of Saskatchewan Huskies women’s hockey team. The Williams Lake, B.C., product was named a first team all-Canadian all-star at the CIS women’s hockey awards night held on Wednesday in Calgary, where the CIS women’s tournament will run Thursday to Sunday. Flinton led all CIS defenders in scoring netting four goals and 22 assists in 28 games. She also posted a plus-15 rating in the plus-minus department. During her career, Flinton was named a Canada West first team all-star twice, a Canada West second team all-star once, and she made the tournament all-star team at the 2014 CIS championship tournament, where the Huskies won a bronze medal. She was also a member of Canada’s FISU games team in 2015. Flinton leaves the Huskies as their all-time career leader in assists with 66 helpers and their fourth all-time leading scorer with 80 points in 131 games. Besides having a spectacular finesse game, Flinton was also tough and departs the Huskies as their all-time career leader in penalty minutes with 176 thanks to taking the odd infraction for bodychecking. Laura Dally received all-star honours. The U of Saskatchewan Huskies women’s basketball team hopes this year’s trip to nationals will finally be a golden one. The Huskies are making their eighth trip in the last nine years to the CIS championship tournament. In the previous seven visits, they made the championship final once falling 63-49 to the University of Windsor Lancers in 2011. That started a run of five straight CIS titles for the Lancers, who did not qualify for this year’s national championship tournament that will be held in Fredericton, N.B. U of S is seeded second in the elite-eight tourney and faces the seventh seeded U of Ottawa Gee-Gees in a quarter-final match on Thursday. The Huskies topped the Canada West standings with an 18-2 record and captured their third conference championship in six years winning four straight post-season games. They downed the U of Regina Cougars 73-62 in the Canada West final. The Gee-Gees topped the OUA standings with a 17-2 record, but fell in the conference title game to the Ryerson University Rams 66-60. If the Huskies win their quarter-final, they will advance to a semifinal contest on Saturday to take on the winner of the match between the third seeded Saint Mary’s University Huskies and the sixth seeded U of Alberta Pandas. The CIS final is set for Sunday (12 p.m. Saskatchewan time, Sportsnet 360). On Wednesday, fifth-year Huskies guard Laura Dally was named a first team all-Canadian all-star. Joelle Fiala had a goal and an assist on Tuesday for the Stars. The Saskatoon Stars will try to keep the Fedoruk Cup in Saskatoon. Saskatoon returned to the Saskatchewan Female Midget AAA Hockey League championship series for a second straight year after knocking off the Weyburn Southern Range Gold Wings 2-0 in Weyburn on Tuesday. The Stars claimed the best-of-five SFMAAAHL semifinal series between the two clubs 3-1. Joelle Fiala and Grace Shirley accounted for all of Saskatoon’s offence in the series clincher each picking up a goal and an assist. Emma Johnson made 26 saves to earn her sixth career SFMAAAHL playoff shutout. Chantal Burke turned away 21 shots taking the loss in goal for Weyburn. The Stars will face the Swift Current Diamond Energy Wildcats in the best-of-five league championship series. The dates of the games are still to be announced. The Wildcats semifinal series with the Prince Albert A & W Bears went to a deciding fifth game on Wednesday in Swift Current. The hosts prevailed 2-1 in double overtime against the visiting Bears thanks to a breakaway winner by Josee Casavant. The Bears thought they netted the winner in the first overtime, but the goal was waved off. Saskatoon claimed last year’s SFMAAAHL title sweeping a best-of-five series with the Bears 3-0. Stars forward Jordyn Gerlitz hugs overtime hero Mackenna Parker (#11). The Saskatoon Stars won’t complain if a break or two falls their way. On Sunday night at the Agriplace Arena, the Stars cashed in on a Weyburn Southern Range Gold Wings giveaway to pull out a 3-2 double overtime victory in Game 3 of a best-of-five Saskatchewan Female Midget AAA Hockey League semifinal series between the two clubs. At the 3:58 mark of a second overtime period, a Gold Wings defender coughed the puck up to Stars forward Anna Leschyshyn. Leschyshyn got the puck to linemate Julia Rongve, who fed a beauty pass across the face of the Weyburn goal to Mackenna Parker. Parker tapped home her sixth goal of the post-season to win the contest for the defending SFMAAAHL champs. The victory allows the Stars to take a 2-1 lead in the series. They will try to wrap the series up in Game 4 on Tuesday in Weyburn. Saskatoon entered play Sunday looking to bounce back from a 1-0 double overtime setback on Friday in Weyburn. In Sunday’s encounter, the Stars came out with a lot of early pressure. They broke through on the scoreboard with three minutes to play in the first period, when 14-year-old forward Joelle Fiala wired a shot through a screen to the top corner of the Weyburn goal. Stars goalie Emma Johnson robs Gold Wings forward Bailee Bourassa. Just 77 seconds later, Saskatoon went ahead 2-0 on what appeared to be a phantom goal. Offensive defender Willow Slobodzian fired a shot on net that disturbed the water bottle that sat on top of the Weyburn goal. It appeared the shot grazed the top of the bottle, but the officials said the puck went into the net after a lengthy conference discussion. The lead evaporated in the second period, when Weyburn forward Bailee Bourassa netted a couple of tallies late in the frame to force a 2-2 tie. Bourassa, who has committed to play for the University of Saskatchewan Huskies women’s team next season, wired home the equalizer from the slot through a screen, while her squad was on the power play. Late in the third, a break went Weyburn’s way to allow the game to get to overtime. With the Stars pressing for the go-ahead goal during a net scramble around the Weyburn net, Bourassa covered the puck up with her hand in the crease to freeze play. A penalty shot should have been awarded, but the officials whistled the play dead for an offensive zone faceoff. Mackenna Parker circles in the offensive zone for the Stars. In the first overtime period, Bourassa had a huge chance to win the game for the visitors, but she was robbed in close by Stars netminder Emma Johnson. Saskatoon then took the contest with Parker’s tally in the second extra session. Johnson made 27 stops to earn the win in goal for the Stars. Chantal Burke turned away 40 shots in another stellar effort in goal for Weyburn. In the other SFMAAAHL best-of-five semifinal series, the Swift Current Diamond Energy Wildcats dumped the Prince Albert A & W Bears 6-0 in Game 3 on Saturday in Swift Current. The Wildcats lead that series 2-1 with Game 4 set for Monday in Prince Albert. Huskies graduate assistant coach Kabree Howard hugs Desarae Hogberg. The heartbreak of a year ago seems like a distant memory. Last season, the University of Saskatchewan Huskies women’s basketball team suffered a tough 69-68 loss in the Canada West championship game in Vancouver, when the host University of British Columbia Thunderbirds prevailed thanks to a game-winning shot in the contest’s dying seconds. After that setback, the Huskies went on to finish fourth at the Canadian Interuniversity Sport national championship tournament. On Saturday playing in front of a raucous home crowd of 2,313 spectators at the Physical Activity Complex, the Huskies weren’t going to be denied a chance to erase that painful memory. Playing their provincial rival University of Regina Cougars, the Huskies trailed 18-15 after the first quarter before hitting high gear. They vaulted out to a 37-31 lead at halftime and jetted out to an impressive 61-39 edge after the third quarter. They cruised to a 73-62 victory from that point to claim their third Canada West championship in the last six years. Dalyce Emmerson knocks in two points for the Huskies. “You can’t describe it to win at home,” said fifth-year superstar post Dalyce Emmerson. “I think what lit the fire was losing last year. “We knew we wanted to come back and win it on our home court. We knew what we could do and what we could accomplish, and that is what we did tonight. The Huskies, who are rated second in the CIS top ten rankings, advanced to Saturday’s title game after downing the University of Alberta Pandas 78-68 on Friday. The Cougars slipped past the MacEwan University Griffins 65-59 in Friday’s other semifinal. Saturday’s championship game started out as a back-and-forth affair that featured eight lead changes. It appeared early on the Cougars, who are rated fifth in the CIS top ten rankings, were going to put up a fierce battle. Backed by one of the loudest crowds the Physical Activity Complex had ever seen, Huskies point guard Sabine Dukate started to drive the ball hard to the hold and nailed four shots from three-point range to lead all scorers with 18 points. Huskies guard Kelsey Trulsrud dives to break up a Cougars pass. Fifth-year guard Laura Dally, who was named the most valuable player of the Canada West conference, had a couple of big blocks on the defensive end and poured in 17 points on the offensive end. Scrappy and energetic fifth-year guard Kelsey Trulsrud, who stands 5-foot-9, was doing everything she could to make plays scoring 12 points, pulling down six rebounds and getting a pair of steals. The Holy Cross High School grad was a force pushing the ball down court in transition. Fourth-year guard Desarae Hogberg also chipped in 12 points to back the Huskies offence, which helped cause another problem for the Cougars. U of S was getting contributions from so many sources that Emmerson, who has willed the Huskies to victory on various occasions in her career, didn’t have to be the focal point for success. She still scored six points, pulled down seven rebounds and blocked three shots in the win. Coming out after halftime, the Huskies outscored the Cougars 24-8 in the third quarter to build a 22-point edge the Cougars couldn’t overcome. Trulsrud said her side did pretty much everything right on both sides of the court during that stretch. Huskies guard Laura Dally blocks a shot. “We made some huge shots,” said Trulsrud. “We limited their touches on offence. Charlotte Kot and Katie Polischuk led the Cougars in scoring with 14 points each. Following the third quarter, the Cougars looked visibly deflated. A mini 9-3 run by the U of R in the closing moments of the fourth quarter made the final score look closer than the contest actually was. Head coach Lisa Thomaidis, who is the Canada West coach of the year, has guided the Huskies program to all four of their Canada West title wins. To her, Saturday’s title win was as enjoyable as the rest. “This was right up there,” said Thomaidis. “We lost some very key cogs in Riley Humbert, Kabree Howard and Jordyn Halvorson. The Huskies and Cougars both advance to the Canadian Interuniversity Sport championship tournament, which runs March 17 to 20 in Fredericton, New Brunswick. In the Canada West Bronze medal game, the Pandas downed the Griffins 66-55. U of A may still qualify for nationals as a wildcard entry. U of S has never won a CIS title in women’s basketball. This year’s Huskies squad would like nothing better than to win this year’s CIS title game. The Huskies enjoy their Canada West championship victory. Why not the Wheat Kings? Kelly McCrimmon has built another championship contender in Brandon. They are arguably the favourite road team on the WHL circuit among hotel and restaurant staffs. When the Brandon Wheat Kings come to down, they dress to impress and carry themselves with a class that matches their look. Hotel and restaurant staffs for years often compliment the players for how well-mannered, nice and personable they are. Excitement usually follows when Wheat Kings head coach, general manager and owner Kelly McCrimmon phones to make a reservation. Road businesses want the Wheat Kings to come to town. Those intangibles have been some of the key reasons as to why the Manitoba’s only major junior franchise finds itself contenting for a WHL title on a regular basis going back to the start of the 1992-93 season. Since that campaign, the Wheat Kings have won more than 40 games 15 times. The good habits and culture they create off the ice translates to a good culture and habits on the ice. Going into the 2015-16 campaign, the Wheat Kings were viewed as a favourite to possibly challenge for another WHL title. While they won’t match their blistering league leading 53-11-4-4 record from last season, the Wheat Kings have been steady. In the current campaign, teams like the Lethbridge Hurricanes, Kelowna Rockets and Victoria Royals have all had surges at different times that have allowed them to float to the top of the league standings. Reid Duke (#27) battles for a draw for the Wheat Kings. The Wheat Kings hovered near the top of the WHL’s East Division for about the first two-and-a-half months of the campaign and have remained in the division lead since returning from the Christmas break. After downing the Blades 5-1 in Saskatoon on Friday night, the Wheat Kings have earned points in their last nine games coming off seven wins and two extra time setbacks. They improved to 44-18-4-2 to sit two points ahead of the Lethbridge Hurricanes (45-21-1-1) for top spot in the Eastern Conference. Brandon also sits two points behind the Victoria Royals (45-16-3-3) for first overall in the league. The Wheat Kings also broke into the Canadian Hockey League’s top ten rankings this week in the 10th spot. During a season where the consensus among scouts is that defence and goaltending across the WHL isn’t as strong as it normally is, the Wheat Kings might be able to finally capture their first league title since 1996. While they have piled up outstanding records in the regular season, the league title has eluded the Wheat Kings including last season, where they were swept away in the WHL final by the Rockets. Jordan Papirny is loaded with playoff experience in goal. This season, the Wheat Kings forward group is as solid as ever. Centre Jayce Hawryluk leads the team in scoring with 42 goals and 56 assists, while 17-year-old sophomore centre Nolan Patrick has impressed with 40 goals and 57 assists. Due to where his birthday falls, Patrick, who stands 6-foot-3 and weighs 195 pounds, isn’t eligible for the NHL Entry Draft until next year. Brandon’s back end is anchored by overage captain Macoy Erkamps, who has 13 goals, 55 assists and a plus-43 rating in the plus-minus department. Russian rearguard Ivan Provorov has also provided an offensive spark with 19 goals and 48 assists to go along with a plus-58 rating. Before the WHL trade deadline, the Wheat Kings also acquired overage defenceman Mitchell Wheaton, who stands 6-foot-5 and weighs 223 pounds, from the Blades to beef up their physical presence. The Wheat Kings back end has more parts than most other teams in the league to get the job done. In goal, 19-year-old Jordan Papirny has carried the load as a starter and has been solid. He has posted a 28-17-6 record, a 2.69 goals against average, a .908 save percentage and five shutouts. Other netminders have better numbers, but Papirny has a tonne of post-season experience. Ivan Provorov has 67 points on defence. Before 4,396 spectators at the SaskTel Centre on Friday, the Wheat Kings showed how opportunistic they can be going 3-for-7 on the power play, while adding a short-handed marker. The short-handed goal was a backbreaker for the Blades, as Hawryluk scored with 1.8 seconds to play in the second to give Brandon a 3-1 lead. The tally came just over two minutes after Blades captain Nick Zajac potted his 20th of the season to pull the host side to within one. Hawryluk also picked up a power-play goal in his two-goal night. Patrick, John Quenneville and Erkamps all potted singles for Brandon. Papirny made 29 stops to earn the win in goal. Brock Hamm turned away 43 shots to take the loss in goal for the Blades. Saskatoon fell to 25-39-4 to officially be eliminated from playoff contention for the third year in a row. The Wheaties appear to be ready for a long playoff run. With the good habits they have developed off and on the ice, all they need are some breaks to go their way in the luck department and that elusive third WHL title in team history might finally fall into their grasp. Chantal Burke (#39) made 42 saves to earn a shutout win against the Stars. The Saskatoon Stars saw their 13 game winning streak in the Saskatchewan Female Midget AAA Hockey League playoffs come to an end on Friday night in Weyburn at the hands of the Esso Cup hosting Gold Wings. Gold Wings forward and University of Saskatchewan Huskies recruit Bailee Bourassa scored 48 seconds into a second overtime period to give her side a 1-0 victory over the Stars, who are the defending SFMAAAHL champions. Chantal Burke made 42 saves to earn the win in goal for Weyburn, while Emma Johnson turned away 41 shots to take the loss in goal for the Stars. With Weyburn’s win, the best-of-five SFMAAAHL semifinal series between the two clubs is tied 1-1. Game 3 of the series is set for Sunday at 4:45 p.m. at the Agriplace Arena in Saskatoon. The other best-of-five SFMAAAHL semifinal series between the Swift Current Diamond Energy Wildcats and the Prince Albert A & W Bears is also tied 1-1.